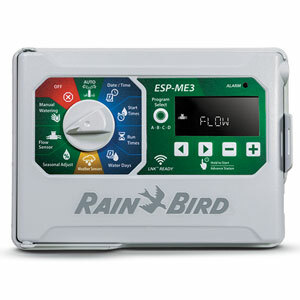 Rain Bird has updated its ESP-Me controller with a new look and improved functionality. Like its predecessor, the new ESP-ME3 can expand from four to 22 stations through the use of additional plug-in modules. However, unlike the ESP-ME, the ESP-ME3 comes in a single model for both indoor and outdoor use, making it possible for contractors to carry just one controller. The new controller is now also compatible with an optional flow sensor, which alerts users to water leaks and can skip irrigation for any affected stations. When the ESP-ME3 is installed with Rain Bird’s optional LNK WiFi module, users can manage irrigation with Rain Bird’s free mobile app. Additionally, the ESP-ME3 offers new app features not available with any of the company’s other residential and light commercial controllers. A new, larger, back-lit display makes the ESP-ME3 easier to read in dark or dimly lit environments, and a dial-based control panel aligns with Rain Bird’s other ESP controllers, but with fewer dial positions for simpler, faster programming, the company said.